Alicia Jones from Gaston, Indiana found two very young and unusual kittens in her barn Saturday. 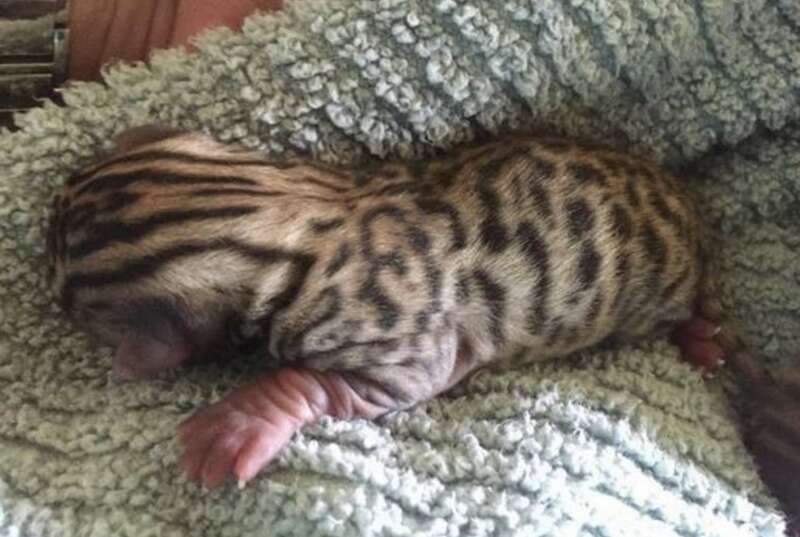 They weighed just a couple ounces each and didn’t appear to be opening their eyes, but it was their black spots and hairless feet that made them look exotic. Alicia Jones immediately took the kittens to the Animal Rescue Fund in Muncie. Angela Sexton, ARF’s cat expert, knew right away they weren’t regular kittens, and a local vet agreed. Sadly one of the kittens unfortunately didn’t make it but the remaining kitten is being bottle fed and is placed in an incubator. They are still trying to determine the breed of this unusual kitten, but it is thought he most likely to be a domestic and wild cat hybrid. Here’s a look at 10 rare and beautiful breeds of wild cat!